Stunned by statistics? Exhausted by Excel? Relax! 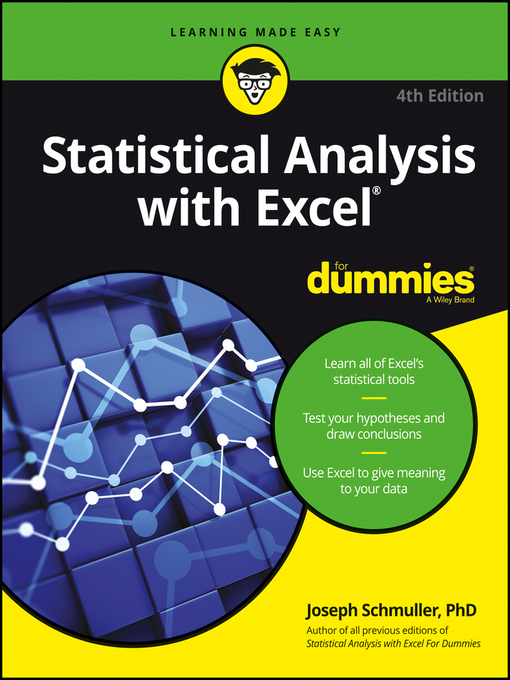 Statistical Analysis with Excel For Dummies, 4th Edition shows you how to use the world's most popular spreadsheet program to crunch numbers and interpret statistics—even if you've never taken a statistics or advanced math course. In no time, you'll learn to use Excel to create and translate statistics in everyday life, understand common statistical terms, and improve your classroom or professional skills. Statistics has a reputation for being a challenging, math-intensive pursuit—but it doesn't have to make your palms sweat. Using a minimum of equations and assuming no prior knowledge of statistics or Excel, this hands-on guide cuts through the jargon and shows you how to make sense of formulas and functions, charts and PivotTables, samples and normal distributions, probabilities and related distributions, trends and correlations, and much more. Forget the mumbo jumbo! This guide shows you that statistical analysis with Excel can be easy, fun, and useful!